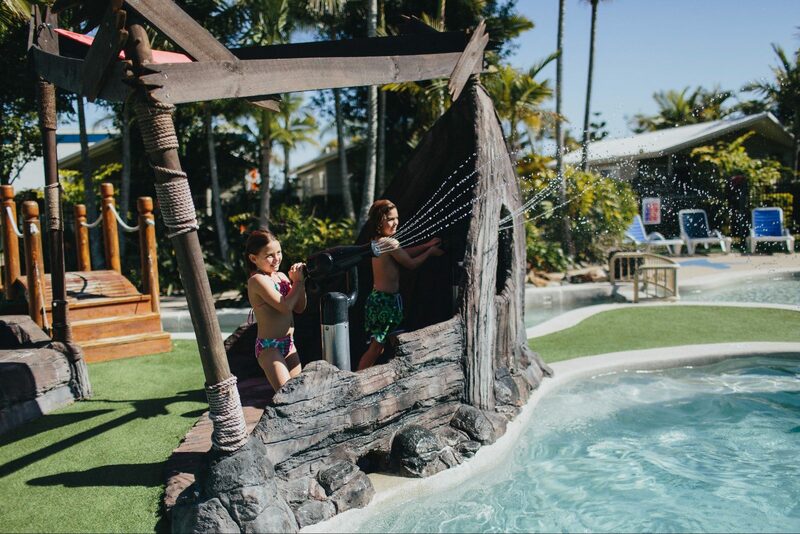 NRMA Treasure Island Holiday Resort is located on the sunny Gold Coast – beautiful one day, perfect the next. 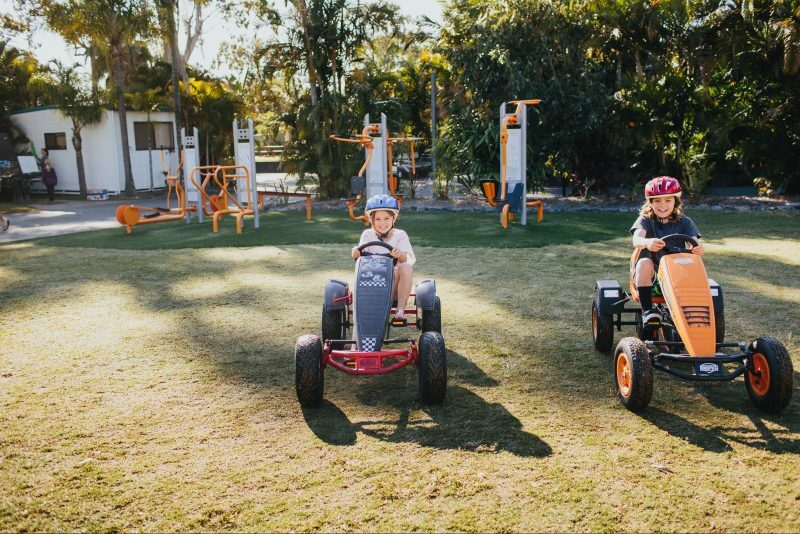 Centrally positioned between all major theme parks, it is just 50 minutes’ drive south of Brisbane and 30 minutes north of Gold Coast Airport. Whatever your style, from one, two and three bedroom cabins and villas, as well as ensuite, powered and unpowered sites, there’s something for everyone. And if it’s a room with a view that you’re after, there are villas overlooking the resort pools and Biggera Creek. Access friendly accommodation is also available. The resort offers a range of modern facilities including 4 resort style swimming pools, heated spas and tennis court. The little ones will love the giant jumping pillow, pirate themed mini golf, kids’ activities and outdoor cinema. And, the onsite Galleons Bistro is perfect for breakfast, lunch or dinner. 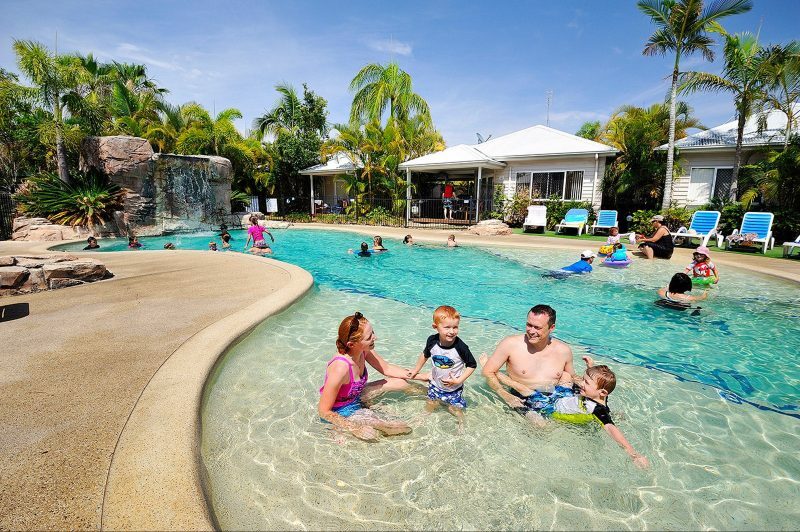 Whether you’re after a relaxing family break or an action packed adventure holiday, NRMA Treasure Island Holiday Resort is the perfect place. 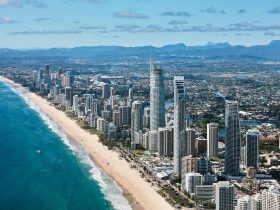 The golden sandy beaches of the Gold Coast and major theme parks are all just a short drive away – and the park is just a short walk to fantastic outlet shopping at Harbourtown. Two bedroom villa. Available to sleep six (One king and two single bunks) or four (one king and two single beds). Fully equipped kitchen including dishwasher, stovetop, convection microwave and fridge; air-conditioning; two bathrooms; veranda with outdoor dining and barbecue; dining table; lounge with flat screen television, DVD and Foxtel; washing machine and dryer; on-site parking space for one vehicle. Accessible cabin available upon request. Centrally located within the park and set amongst landscaped gardens, this two bedroom villa sleeps six. One queen bed in the main bedroom and two single bunk beds in the second bedroom. Kitchen including stovetop, microwave and fridge; air-conditioning; one bathroom; small veranda with outdoor dining; dining and lounge area with flat screen television; on-site parking for one vehicle. This two bedroom villa sleeps six with one queen bed in the main bedroom and two single bunk beds in the second bedroom. Fully equipped kitchen including stovetop, microwave and fridge; air-conditioning; one bathroom; small veranda; dining and lounge area with flat screen television DVD; on-site parking for one vehicle. Offering garden views, this unit sleeps four. One queen and one single bunk bed in an open plan studio layout. Kitchenette including microwave, fridge, toaster and kettle; air-conditioning; one bathroom; patio; sofa; flat screen television and Foxtel; parking for one vehicle. Situated close to the Main Pool and Spas, playground and barbecues, this two bedroom villa sleeps seven. The main bedroom has one queen bed with television and the second bedroom has one double with single top bunk and one single bunk. Fully equipped kitchen including dishwasher, stovetop, microwave and fridge; air-conditioning; one bathroom; two verandas (one small); dining table; lounge with flat screen television, DVD and Foxtel; on-site undercover parking for one vehicle. Overlooking the Riverside Pool and Biggera Creek, this three bedroom villa sleeps eight and features a queen bed and television in the main bedroom, queen bed in the second bedroom and two single bunk beds in the third bedroom. Fully equipped kitchen including dishwasher, oven, stovetop, microwave and fridge; air-conditioning; two bathrooms; veranda overlooking the pool; dining setting and lounge with flat screen television, DVD and Foxtel; garage for one vehicle. Located close to the basketball and tennis courts, this two bedroom villa sleeps seven. One queen bed in the main bedroom; one double with single top bunk and one single bunk bed in the second bedroom. 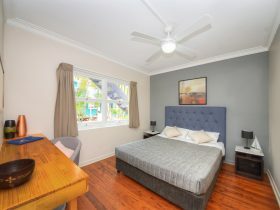 Fully equipped kitchen including oven, stovetop, microwave and fridge; air-conditioning; one bathroom; veranda with outdoor dining; dining and lounge area with flat screen television, DVD and Foxtel; on-site parking for one vehicle. Situated close to the main pool and spas, playground and barbecues, this two bedroom villa sleeps six. The main bedroom has one queen bed with television and the second bedroom has two single bunk beds. Fully equipped kitchen including stovetop, microwave and fridge; air-conditioning; one bathroom; veranda; dining table and lounge area with flat screen television and DVD; on-site parking for one vehicle. Luxury camping overlooking the creek. Safari tent with one queen and one single bunk. 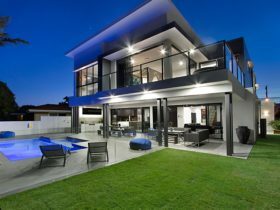 Features; kitchenette including microwave and fridge; dining area; bathroom; veranda with barbecue, outdoor furniture and dining area; sofa and seating area with television . Located by the jumping pillow, this two bedroom unit sleeps five. One double, one single and two single day lounges. Full kitchen including stovetop, microwave and fridge; air-conditioning; one bathroom; patio; dining and lounge area; television; parking for one vehicle. Powered grass sites with driving strips and a concrete slab. 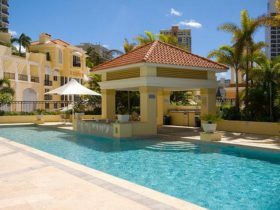 Located close to amenities, barbecues and the Main Pool. Please note: Caravans and motorhomes only. The maximum length of Van/Motorhome permitted on these slab sites is 28ft (approx 8.5 meters). Please specify in the notes section the length of your Van/Motorhome at the time of confirming the booking. It is very important that you book the correct size site for your Van/Motorhome. Please contact the property if you do not feel that your Van/Motorhome and vehicle will fit within this space. Powered Ensuite Site with private shower, vanity and toilet. Positioned by Biggera Creek and close to the Riverside Pool and barbecue. Each site also features astro turf for your annexe and driveway. Please contact the property if your vehicle or tent exceeds 17ft x 15ft and specify in the ‘notes’ section the size of your caravan, motorhome etc. at the time of confirming the booking. It is very important that you book the correct size site. Please contact the property if you do not feel that your Van/Motorhome and vehicle will fit within this space. Ideally located close to facilities and just a short stroll from amenities. Please note: strictly tents only, maximum of 7 x 5 meters. If a larger space required, please call park directly. Please specify in the ‘notes’ section the dimensions of your tent at the time of confirming the booking. It is very important that you book the correct size site for your tent. Please contact the property if you do not feel that your tent and vehicle will fit within this space. Prices vary depending on seasonality, number of guests and availability. They are subject to change without notice.